Almost the weekend ! :) Do you need an idea for a stunning desert ? 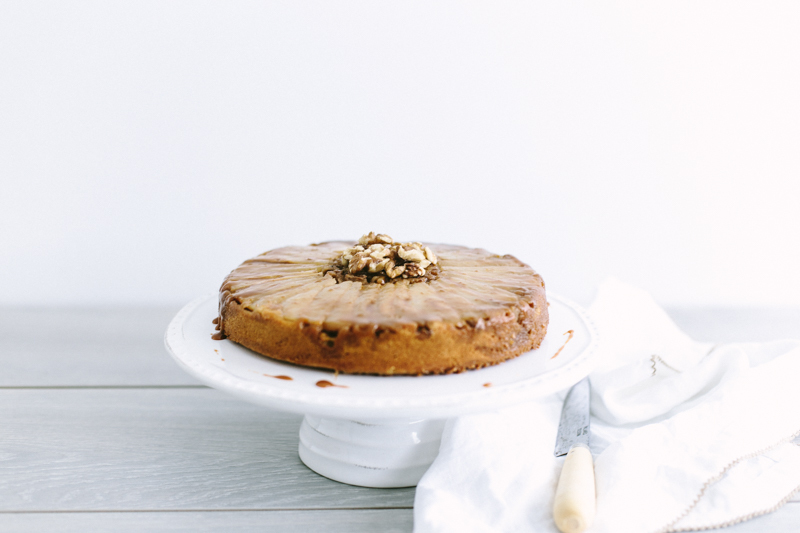 Check this ginger and pears upside down cake created by Emma ( an amazing stylist/baker from Sydney!) ! What an interesting combination, isn’t ? 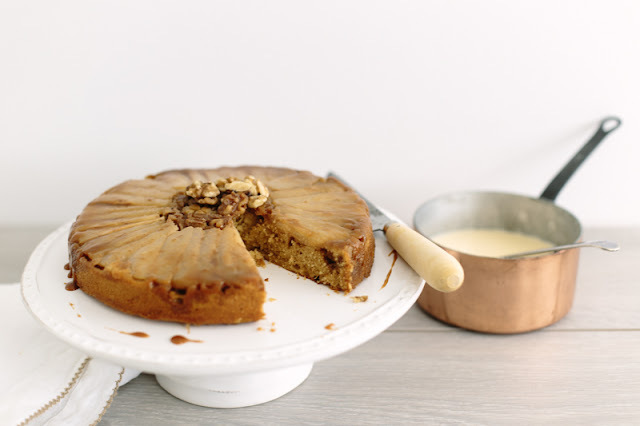 A touch of ginger to shine and with the caramelised pears and crunch of walnuts you will love this one. Apparently, the placement of the pears on the bottom dictate how the cake will ultimately look so take a moment to fan the pears out when laying them in the pan. You can add custard or crème anglaise or like the French, add a creamy vanilla bean ice cream served when the tart is warm will be perfect also ! 1. Preheat oven to 180°C. Butter a 22 cm spring form cake tin, line the sides and bottom with greaseproof paper and butter lightly. 2. To prepare the pears place the butter and brown sugar in a medium saucepan and cook over a low heat for 1–2 minutes, until the sugar dissolves. Add the pears and lemon juice and cook for 3–4 minutes, stirring all the time. Remove from the heat set aside for 15 minutes or until cool. 4. Cream the butter and brown sugar until light and fluffy. 5. Add the eggs, one by one, fully incorporating the first before adding the second. 6. Sift the flour and ginger together and fold in carefully. 7. Add lemon juice and enough cooking liquid from the pears to form a soft cake mix. Reserve a table spoon or two of the liquid for drizzling when ready to serve. Add remaining walnuts (chopped) to cake mix and fold in. 8. 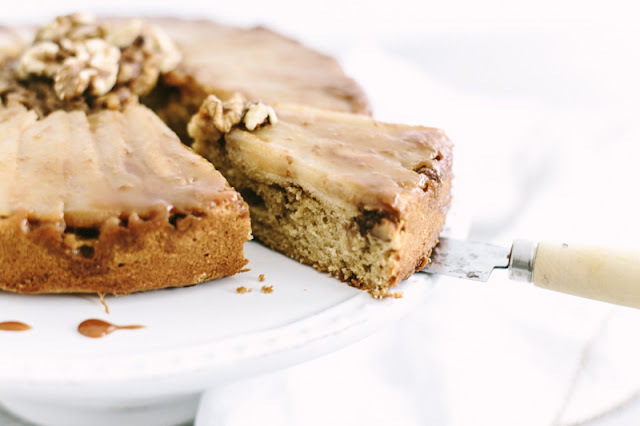 Spoon into the cake tin over the pear slices and bake in the preheated oven for 40 minutes. Test the cake by inserting a skewer. If it comes out clean, the cake is ready; if it doesn’t, cook for a further 5 minutes and test again. 9. Allow the cake to cool for 15 minutes, then carefully turn out onto a plate to reveal the top. Drizzle with the remaining pear liquid.. 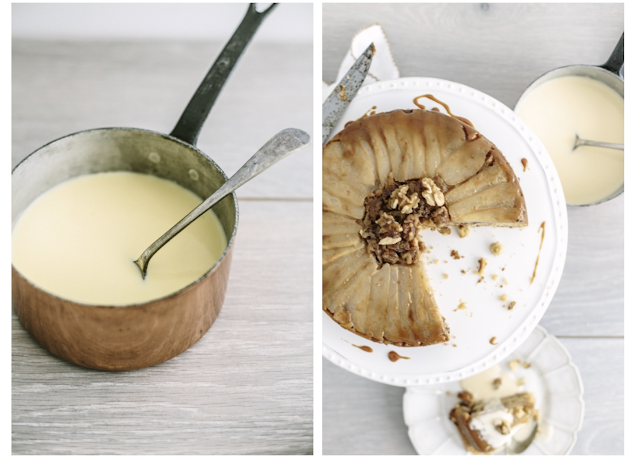 Serve with homemade creme anglaise, icecream or cream.